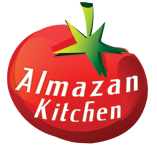 Popular dish performed by AlmazanKitchen! An awesome beef refrigerated in snow, coated in best marinade with healthy garnish made of broccoli, spring onions and spinach, we added some roasted cashew nuts for the flavor. We didn’t also forget about the appetizers – hot rice rolls under good amount of teriyaki sauce. Mmm… Marvelous! You don’t want to miss this! Grind 50g of ginger and 3-4 garlic cloves in the mortar using pestle. Add 1 tbsp. of dark soy sauce. Slice 500g of refrigerated beef into thin rounds. Coat the beef in marinade and leave to marinate for a while. Fill the pan with snow, melt it. Soak rice pepper in the water. Fill rice pepper with chopped chili and onion greens, roll up. Remove the stems from broccoli. Roast 1 tbsp. of cashew nuts. Preheat the pan, grease with oil. Stir fry marinated beef for few minutes. Put aside. Fry broccoli and onion for a while. Do not forget to stir. Toss beef into the pan. Cook everything together, do not forget to stir it. Add 1 hand of snow to deglaze. Toss in handful of spinach and roasted cashew nuts. Place everything on the plate. Pour good amount of teriyaki sauce over the hot rice rolls.